This is a lovely cuddle of a soup. Sweet and warming. Take the squash; peel, de-seed, and chop into small pieces. Place into a roasting tin with some olive oil and season well with salt and pepper, give this a good mix to ensure the oil, salt & pepper is covering the squash. Put into a preheated oven (gas mark 5), and roast until soft, turn once or twice. It should take about 20 – 25 minutes to cook. While the squash is roasting, peel and chop the onions. Saute these over a medium heat in a pan with a little olive oil, as they start to brown add a large knob of butter. Once the butter has melted add enough brown demerara sugar to just cover the onions. Lower the heat and allow the onions to caramelise in the sugar. Make sure to stir regularly and don’t allow the sugar-onion mix to burn on the bottom of the pan. Once the squash is roasted and soft (you can test with the tip of a knife), add it to the onion. Pour in enough vegetable stock (probably about a pint) to cover both and bring to the boil. Turn down the heat and simmer for about 10 minutes. While the mixture is cooking, wash and coarsely chop and large bunch of parsley, and then add to the simmering mix. Remove the soup from the heat and pour into a liquidizer (you may need to do this in batches) and blitz until smooth. Alternatively blitz in the pan with a hand blender (being careful not to splash yourself with the hot mixture)! Return the now smooth mixture to the heat, and bring back to the boil. Serve with crusty sourdough or bread of your choice. Once cool this will keep in a refrigerator or can be frozen to enjoy at a later date. 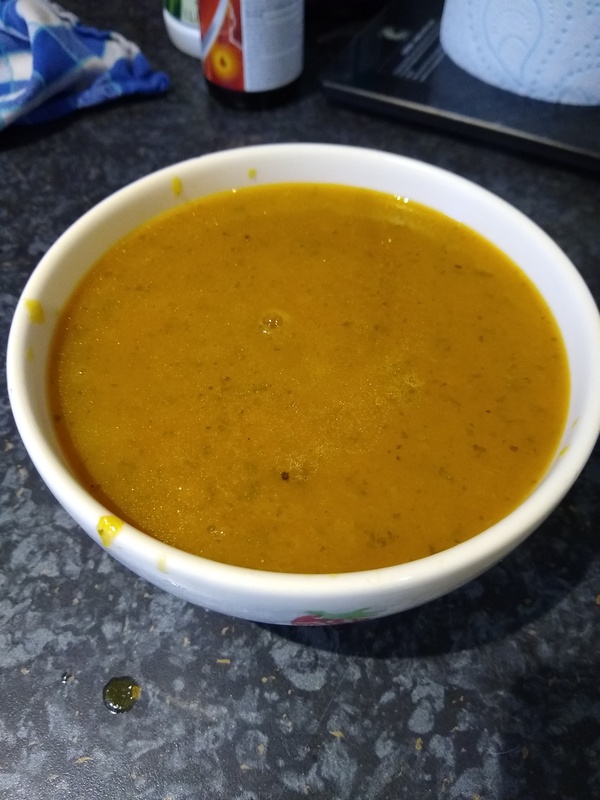 This entry was posted in Cooking, Fork To Fork, Self-sufficient and tagged butternut squash, caramelised onion, cooking, fork to fork, onion, plot to plate, soup. Bookmark the permalink.